LOUISVILLE, Ky. (AP) — Louisville interim football coach Lorenzo Ward said he is focused solely on salvaging the Cardinals‘ final two games rather than whether he will have the job permanently. It’s unclear who will be Louisville’s next head coach, whether it’s Ward or possibly Purdue’s Jeff Brohm, a former Cardinals quarterback who has been mentioned as a possible candidate. It’s a challenge either way: Whether Ward gets the job is not within his control and ending the Cardinals seven-game slide that won’t be easy against North Carolina State on Saturday. “We’re going through tough times,” Ward said Monday in his first news conference as interim coach. “They’re used to winning. We’re not, and the thing we want to do is try to make these next two weeks as fun as we can possibly make them. Ward, 51, was named Sunday to replace Bobby Petrino, who was dismissed after a 2-8 start featuring a handful of blowout losses. Louisville athletic director Vince Tyra said he tabbed the second-year safeties coach for his administrative and leadership skills. No matter how the season ends on the field, Ward might not keep the job permanently. There are already questions about who take the reins after the season finale against No. 20 Kentucky. 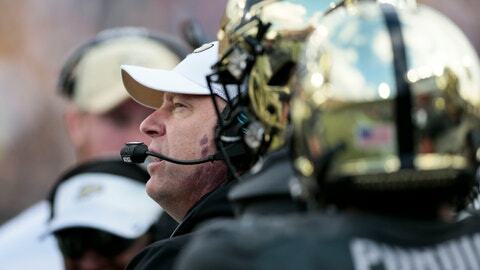 Brohm has been frequently mentioned as the top candidate. The former Cardinals quarterback who became an assistant under Petrino acknowledged the reports Monday but dismissed them, saying he is concentrating on making the 5-5 Boilermakers bowl eligible. Ward is little short-handed in his preparation for the Boilermakers — three assistants were also let go. Petrino’s son, quarterbacks coach Nick Petrino, defensive line coach L.D. Scott and linebackers coach Ryan Beard were also shown the door along with director of football operation Andy Wagner. Ward — whose defensive background includes spending the 2009-15 seasons at South Carolina coaching backs and linemen such as 2014 NFL draft No. 1 overall pick Jadeveon Clowney — will handle defensive line duties along with quality control coach J.B. Lageman. Grady Brown will coach the secondary, while first-year defensive coordinator Brian VanGorder will maintain his current role. Offensive coordinator Lonnie Galloway will call plays and coach the quarterbacks. The next step is getting effort from a Louisville squad that has underachieved in many phases. The Cardinals (0-7 Atlantic Coast Conference) enter Saturday’s meeting with North Carolina State (6-3, 3-3) ranked at or near the bottom statistically in conference offense and defense. Last week’s 54-23 loss at No. 12 Syracuse followed a 77-16 shellacking at No. 2 Clemson and led to Petrino’s firing after a five-year second stint with the program. He will receive a $14 million of his contract. Tyra on Sunday questioned the Cardinals’ effort in some contests, which Ward slightly disagreed with. But the interim coach conceded there’s room for improvement. The Cardinals’ morale hasn’t been helped watching opponents regularly hang 50-plus points on them, either. Whether Ward changes things over the next two Saturdays remains to be seen, but players look forward to seeing what new leadership brings. Until the next change, that is. “I was shocked, but at the same time it was only a matter of time,” junior defensive lineman G.G. Robinson said of Petrino’s dismissal. “It was like a big unknown cloud over everybody. We were having a bad season.